This is the house described by Louisa May Alcott in her famous novel Little Women. Most of the furnishings are those of Margaret Sidney, author of Five Little Peppers. Located a mile (1.6 km) east of Concord's Monument Square and just a few steps east of Orchard House(map), The Wayside is the house Louisa May Alcott described in her famous novel, Little Women. The Alcott family lived in this house, which they called "Hillside," from 1845 to 1852, when Louisa was a teenager. She later complained that Hillside and nearby Orchard House, where she lived later, were cold, dreary and lacking sunlight. During her years here, Louisa had a teenage crush on her father's friend Ralph Waldo Emerson. She was a hiking buddy of Henry David Thoreau, and stories circulate of Louisa and teenaged friends going skinny-dipping in Walden Pond. 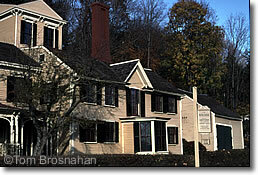 In 1852, the Alcotts sold Hillside to Nathaniel Hawthorne and Sophia Hawthorne, who moved in with their three young children Una, Julian and Rose, and renamed the house "The Wayside." It remained the Hawthorne family home until Nathaniel Hawthorne's death in 1864. In 1870 it was sold by Hawthorne's heirs, and in 1883 bought by Boston publisher Daniel Lothrop and his wife Harriet Lothrop, a children's book author who used the pen name Margaret Sidney and was widely known for her book The Five Little Peppers. Margaret Lothrop, daughter of Harriet, inherited the house, and in 1963 it was declared a National Historic Landmark. A few years later it became part of Minute Man National Historical Park. The Wayside, administered by the National Park Service, re-opened in 2016 after extensive restoration. There's free parking in a special lot across the street from the house—follow the signs. lots of writing done here!